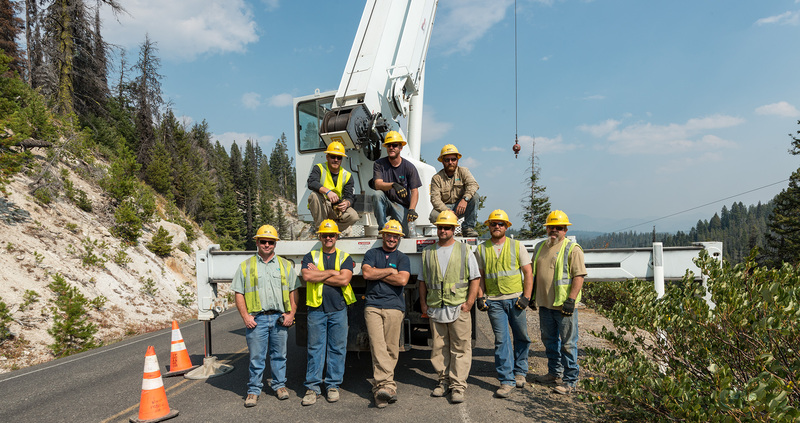 Idaho Power offers eight different training programs, all recognized by the U.S. Department of Labor Office of Apprenticeship. These career opportunities offer excellent compensation, career advancement, stability and a chance to provide a valued service to our customers. Click the name of an apprenticeship to view details. Want to join our team of outstanding apprentices? Visit our Career Opportunities page to view available apprenticeship job postings and apply online. Apprentice applicants must be at least 18 years old and meet all basic requirements as listed on the job posting. See our Frequently Asked Questions for application process instructions. If you’re unfamiliar with Idaho or Oregon, learn why working and playing here is so rewarding. Learn more about career opportunities in the energy industry by visiting www.getintoenergy.com. The following is a typical list, other duties may be required. Build and maintain distribution overhead and underground and/or transmission lines and facilities, both energized and de-energized. Assist in stocking line trucks and maintaining tools and equipment. Drive, maintain and operate lines vehicles and properly station them for the work to be done. If you’re interested in applying for an apprenticeship position, you must wait for one to be posted on our Career Opportunities page. The station technician works in a team atmosphere to learn the mechanics of operation, maintenance, testing, troubleshooting and installation, and repair of station apparatus. Assist in performing minor and major maintenance and repair of apparatus, equipment and station facilities. Assist with emergency operation of stations and station equipment. Assist with installing and commissioning substation equipment. Assist in moving power transformers and regulators, including oil handling, loading, unloading, refilling and preparing for service. Assist in maintenance of power transformers and regulators, including switching equipment out of service, wiring, replacing gaskets, grounding, rebussing and other work required to return equipment to service. Assist with tests of station apparatus using a variety of test equipment. Assist with switching and operation of station equipment. Under the direct guidance of meter technicians, the meter technician apprentice learns to plan, coordinate and perform meter site verifications, metering installations, planned and unplanned metering maintenance and meter accuracy testing in accordance with industry standards and the Meter Quality System requirements. The apprentice is responsible for learning the Meter Quality System requirements in his/her area of control and is accountable for adherence to the system requirements. Meter technician apprentices will learn to plan, execute and keep records of projects related to periodic and statistical maintenance programs, new technology implementation and control of meter quality system non conformance. They will also learn to investigate power quality problems. Satisfy the requirements of the apprenticeship training program and becomes certified by the Office of Apprenticeship. Learn to perform verification and testing of metering equipment and installations, including self-contained secondary, 480-V metering, transformer-rated secondary, transformer-rated primary, transformer-rated substation and transformer-rated transmission station. Learn to plan, coordinate, and/or perform metering installations and maintenance activities. Learn to energize and de-energize distribution and service facilities to facilitate metering installations, maintenance, and customer connections and disconnections. Learn to use a personal computer and mainframe applications to maintain all relevant records related to metering. Become proficient at detection and correction of non-conformities to meter quality system requirements, including troubleshooting, corrective action, calculation of billing corrections and assisting in implementation of preventive action. Communicate with customers and other stakeholders regarding metering issues. May occasionally be required to perform connects/disconnects, field collections and mentor the meter specialists on the metering team. Under the guidance of a lines operation technician II, the line operations technician apprentice is responsible for the installation, operation and maintenance of capacitors, reclosers, regulators, sectionalizers, line relays/controls, distribution automation systems and remote device communications systems. The apprentice provides technical expertise and support for lines operations and emergency restoration. He/she works closely with the regional engineering teams and monitors devices for correct operation and appropriate settings. Participate in automated capacitor programs and integration into the Automated Capacitor Control (ACC) system. Oversee the installation of growth-related capacitor banks. Prepare existing capacitors for summer peak. Set up and troubleshoot communications with remote line devices and various automation systems. Set up and troubleshoot automated switching schemes for large commercial and industrial customers, including customer interaction. Monitor and upgrade line voltage regulators and controls. Manage line recloser and capacitor periodic maintenance programs. Create the relay/control setting and maintenance database. Collect actual field measurements of feeder loadings and voltage levels for model verification and calibration. Provide training to teams and line crews on line equipment controls. Perform field and bench repairs of electronic and microprocessor line equipment controls. Assist in the analysis of lines systems operations. Ensure protective schemes are performing to lines design/performance expectations, by test or analysis. Initiate action to resolve apparatus problems that arise, and evaluate changes to ensure accurate, timely and efficient implementation. Under supervision, the relay technician apprentice ensures secure operation of interconnected electrical power-system operations by installing, commissioning, troubleshooting, repairing, testing and maintaining power-system monitoring equipment; Supervisory Control and Data Acquisition (SCADA) remote terminal units (RTU); remedial action schemes (RAS) and protective relay, control and communication systems. The apprentice performs these duties under the supervision of a relay technician and/or system protection and communications leader. Perform both routine and emergency testing and maintenance on power system protective relaying, monitoring and communications equipment. Ensure all transmission system operations are analyzed for cause and proper operation and apply corrective actions, as required, in coordination with system-protection engineering. Interpret and analyze power, control and communication system test data. Calibrate power-system monitoring equipment, transducers and protective relays. Read and properly interpret substation drawings (e.g., single-line drawings, AC and DC schematics, panel wiring diagrams and panel layout drawings). Install, test and terminate fiber-optic circuits. Work as a member of project teams to assist with scoping, detailed design review, shop panel testing, project construction and commissioning. Respond to power system emergencies and be available to stand as after-hours system support/on-call. If you’re interested in being considered for an apprenticeship position, you must wait for one to be posted on our Career Opportunities page. Under supervision, the communication technician apprentice ensures secure operation of the interconnected electrical power system by installing, commissioning, troubleshooting, repairing, testing and maintaining communications systems. Communications systems include: microwaves, power line carriers, telephones, fiber optics, leased circuits, mobile radio systems and other related electronic equipment. Install, troubleshoot and repair two-way mobile radios. Ensure all communications system trouble alarms are analyzed for root cause and system service is restored or maintained, in coordination with System Communications Engineering. Perform testing and maintenance of power line carrier systems. Perform scheduled inspections and maintenance routines to evaluate the status and performance of the interconnected power system communications grid, in accordance with North American Electric Reliability Corporation (NERC) standards. Perform testing, installation, commissioning and maintenance of microwave and fiber-optic equipment. Perform communications site maintenance, including battery and emergency power systems. Maintain the communications database (CommData) with new equipment, test data, new test plans, and schematic changes. Works as a member of project teams to assist with scoping, detailed design review, shop panel testing, project construction and commissioning. Respond to system emergency situations after normal business hours in on-call rotation. This is a training position, designed to prepare future generation specialists for work in a team based atmosphere. These individuals will learn how to operate and maintain a hydro plant and associated equipment. Other tasks include normal hydro plant housekeeping, park maintenance and preventive maintenance on hydro plant equipment. Operate and maintain electrical equipment: generators, governors, exciters, voltage regulators, transformers, motor generators, cranes and hoists, power circuit breakers, turbines, pumps, air compressors, building and vehicle wiring and other auxiliary equipment. Operate and maintain dams, waterways, intakes, spillways, penstocks, gates, turbine runners, bulkheads and other related equipment. Operate and/or maintain trucks, cranes and other heavy equipment used in conjunction with maintenance and repair work. Perform preventive and corrective maintenance on the power facilities, buildings, fish facilities and other associated equipment. Design, fabricate, assemble, install and perform modifications to existing and new equipment. Coordinate plant maintenance and operation with generation dispatchers. Work with plant generation specialists and technicians on various projects. The generation technician apprentice provides technical support to generation plants in the procurement, installation and programming of new equipment. He/she assists and receives training from journeyman technicians and/or supervisors in performing the necessary functions to maintain power plant apparatus in reliable working condition. This includes programming, maintenance and service work. The apprentice completes additional assigned tasks and assumes a lead role when necessary. Perform maintenance and service work on power plant apparatus and equipment, including protective relays and devices, indicating and recording instruments, SCADA and load control equipment, voltage regulators, governors, controls for cranes and hoists, circuit breaker mechanisms and controls, start and shutdown controls of the main generating units, microwave radio and multiplex equipment, telephone systems, protective relaying carriers, and microprocessors. Assist in the installation, wiring, programming and checking of equipment additions. Provide assistance in the design and installation of control systems and software programs, and in the proper use of test equipment. Conduct tests, make adjustments, diagnose trouble and take measures to correct it. Update plant prints as changes are made and provide technical assistance as needed in procuring and installing new equipment and maintaining existing equipment. Keep records of maintenance and spare parts. Actively participate in and promote a team atmosphere, including performing other duties as assigned, participating in team meetings and receiving training from journeyman technicians as needed.